Benjamin Netanyahu’s visit to Oman for talks with Sultan Qaboos has shed new light on Israel’s largely clandestine links with Arab states, especially in the Gulf. The most striking thing about the trip is that it was the first by an Israeli prime minister to any Arab state (other than Jordan or Egypt, with which Israel has long had peace treaties) at a time when there is no Israeli-Palestinian peace process – not even one that is going through the motions of serious negotiation. The last US-brokered talks ended in 2014. Prospects for progress under Donald Trump look poor in the face of widespread scepticism about his promised “deal of the century” and Palestinian anger over his recognition of Jerusalem as the capital of Israel, and other hostile moves. Still, a joint Omani-Israeli communique did mention “prospects for peace”. Its credibility was bolstered by the fact that the Palestinian president, Mahmoud Abbas, had met Qaboos two days earlier. The communique also referred opaquely to discussions of “a number of issues of mutual interest for peace and stability.” Of the Palestinians, however, there was no specific mention. Nor was there any public reference to Iran, which is intriguing given Muscat’s uniquely good relations with Tehran, the imminent re-imposition of US sanctions following Trump’s withdrawal from the 2015 nuclear agreement, and Iran’s deepening role in Syria – an issue of mounting concern to Israel. Israel’s own statement about the visit was clearer. It called it a “significant step in implementing the policy outlined by Prime Minister Netanyahu to strengthen ties with the countries of the region, while leveraging Israel’s advantages in security, technology and the economy.” It was no coincidence that his delegation included the head of the Mossad secret service, Yossi Cohen, who is in charge of secret contacts across the Middle East. It was also announced that Israel’s transportation minister is to shortly attend an international conference in Oman to promote a regional railway project linking Haifa with Jordan, Saudi Arabia and the Gulf states. Reactions, especially on Arabic social media, reflected inevitable controversy around the Qaboos–Netanyahu meeting and anything smacking of “normalisation” (tatbi’a in Arabic) with Israel. That issue is more often discussed with reference to the UAE, Saudi Arabia and Bahrain, which are thought to have the most developed links with Israel. It figures prominently in toxic exchanges over those countries’ blockade of neighbouring Qatar. Israel’s official silence over the Jamal Khashoggi affair has been widely interpreted as deference to Riyadh. The regional picture is indeed changing: on the same day Netanyahu returned from Muscat Israel’s minister of sport and culture, Miri Regev, was in Abu Dhabi at a judo competition, where for the first time the country’s national anthem was played. Israeli sportsmen were also at a competition in the Qatari capital Doha. Another Israeli minister is due in Dubai shortly. Critics denounced the Omani move as “shameful,” and demanded that any normalisation must take place within the framework of the 2002 Saudi peace initiative, which calls for a just solution to the Palestinian question on the basis of the 1967 borders. Supporters of the BDS movement attacked Qaboos as just another dictator ignoring popular sentiment. Netanyahu’s approach is often described as an “outside-in” solution to the Palestine question – one in which Israel strikes deals with Arab states the in order to pressure the Palestinians to accept whatever terms are on offer – however unpalatable they are. Israel has always aspired to better relations with the wider Arab world, but those do still depend, to a greater or lesser degree, on resolving the Palestinian issue in an acceptable way. 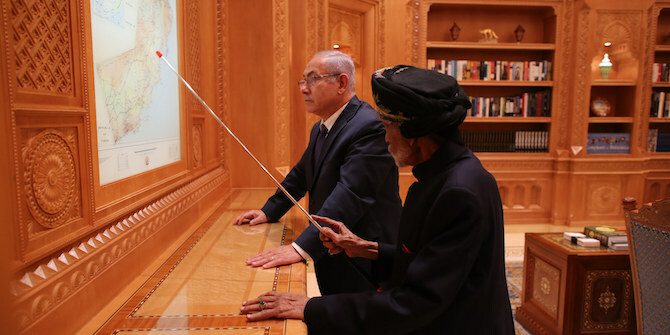 Netanyahu was not, after all, the first Israeli prime minister to visit Muscat. Yitzhak Rabin was there in 1994 and Shimon Peres in 1996. But their talks took place in the wake of the Oslo agreement between Israel and the PLO – when a significant peace process was under way and there were hopes for a resolution of the conflict. That is no longer the case – and it is a highly significant difference.